Although much of the year is wet and chilly in the Pacific Northwest, the inside of your home does not have to be. Believe it or not, your exterior doors prevent a significant amount of energy loss in your home. When you have insufficient doors, you are essentially pumping heat into the outside air, which does not do anyone much good. When you install modern exterior doors in Vancouver, WA, you will notice your home staying warmer and dryer, even during the most trying months. Today doors are much more ecologically and economically efficient. With a new door installation, not only do you receive a strong, sturdy barrier, you also get proper insulation and weather stripping. Adequate insulation is critical to preventing energy loss, since heat can pass straight through poorly insulated doors. Weather stripping prevents moisture and air from seeping in between the door and the frame, further insulating the door. 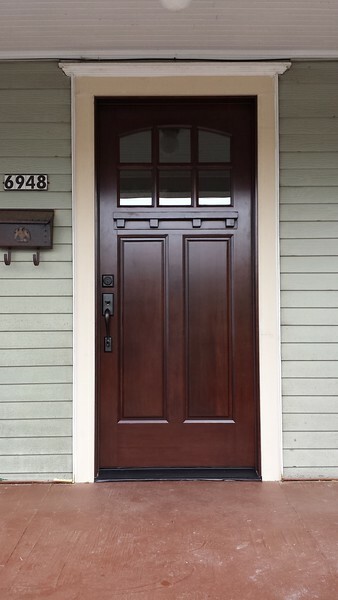 Modern exterior doors in Vancouver, WA come in a variety of styles and designs. From French to sliding, there is a door suitable for almost any home. Most reputable contractors will use doors with a lifetime guarantee, which includes a lifetime of energy efficiency. Replacing your doors can be a costly hassle, but if installed properly, your exterior doors can last for a very long time. Your doors are your gateway to the outside world, and they should be pleasant and inviting. Furthermore, a new front door is likely to increase your homes curb appeal, which can increase the resale value. Investing in modern exterior doors in Vancouver, WA can not only improve your homes energy efficiency, it can also add value to your home. Consult with your local exterior remodeling contractor to find out how you can lower your energy bills, increase your resale value and generally improve your home when you install new exterior doors. Keep the weather outside where it belongs.